Image via earth911.comJust because it's 2012 don't kick your Christmas tree to the curb! Recycle it! Building on the success of previous years' treecycling efforts, more than 20 local, civic and nonprofit organizations are working together to recycle trees this year. 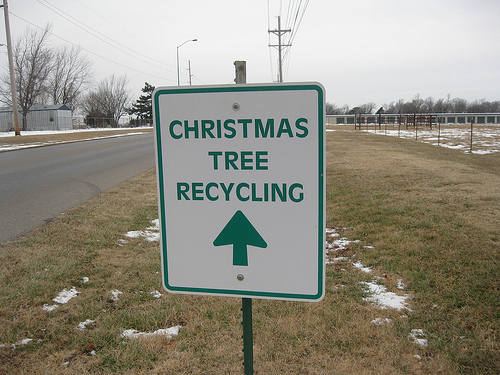 If you leave your tree out at the curb to be picked up by the city, it will go to a landfill or incinerator. Instead, bring your tree to one of the treecycling events happening throughout the city? Chestnut Hill (9:30a.m. - 12:30p.m.) - Green in Chestnut Hill at Norwood Fontbonne School on Sunset Ave.
Mt. Airy (1 - 4p.m.) - East Mt. Airy Neighbors at Gabbie’s Garden on Chew Ave.